The Sad Tale of the Christmas Tree Tax, or, How Stupid People Ruin Everything for the Rest of Us. Everything that is wrong with our political process can be found within the sad, miserable story of the Christmas Tree Tax That Never Was. Some of you have already heard this story and don't wish to re-hash it. That's fine; you can go read something else. This is for the rest of you. Let's begin at the beginning, shall we? In 1996, Congress passed the Commodity Promotion, Research, and Information Act. The idea was to let farmers vote in a self-funded marketing campaign, and if the vote passed, some small fee would be assessed on farmers (who voted for it in the first place) and the money would be collected by the USDA and spent on a marketing camapaign. This was widely seen as a good thing, and milk, honey, pork, avocado, and blueberry producers have all voted in a fee to fund a marketing effort. You've seen those commercials. But it's more than the commercials--it's having someone who can talk to the media, someone who can fund research, someone who can place a magazine ad or sponsor a parade or whatever needs to be done. And this is a good idea on so many levels. For one thing, we all want our blueberry and avocado farmers to have a good market for their fruit, right? And in general, we want to see blueberries advertised at least as well as Pop-Tarts are, right? The fact is that Big Industry has deep pockets for marketing. Soft drinks, potato chips, candy--all that crap benefits from massive ad campaigns. Strawberries don't stand a chance--unless the strawberry farmers organize. And asking farmers to voluntarily chip in for some little effort run by some little group has been tried and didn't work, which is why Congress, at the request of the farmers, created a mechanism by which a larger and more official process could be put into place to fund these ad campaigns. So that's what they do! And it's great! They vote themselves in some small little assessment, everybody pays it, and commercials for their products appear on TV. If they liked how that worked out, they can vote to keep it going, and if they don't like how it worked out, they can bag the whole thing. As a small business owner, I can assure you that banding together with other local businesses for a shared marketing campaign is the way to go. One blueberry farmer can just not do this on their own. Which brings us to the Christmas tree farmers. Christmas tree farmers have seen a decline in sales as artificial tree sales have gone up. During that same period, the artificial tree manufacturers have spent big bucks on ads, while the tree farmers have spent bupkis. How could a humble farmer compete with this magnificent fake thing? And before you get all "artificial trees are better anyway because (insert your reason here)," just remember that (a) having a live tree does not deprive some forest of its young--they're grown in rows on farms, and (b) young, growing trees sequester all sorts of carbon, so they're probably good for the planet overall, and (c) it's a farmer growing a thing here in the United States, and I'm just generally in favor of us having farmers who grow stuff. Period. Oh, and (d) some of us like a live tree. You don't have to. Some of us do. So the vote passed, on and November 8 the USDA published a final rule, and offered reasonable, thoughtful responses to a few minor criticims and mostly unfounded complaints, and the program was all set to move forward. So then what happened? The Heritage Foundation. That's what happened. I refuse to link to their website, but the gist of it was: "The economy is barely growing and 9 percent of the American people have no jobs. Is a new tax on Christmas trees the best President Obama can do?" And then Fox News got involved, and others of that ilk I also refuse to link to, and we got "This new tax is a smack in the face to each and every American who celebrates Christmas." That's right. Of course. President Obama woke up one morning in his usual Christmas-hating mood and, casting about for a way to take more money out of the pockets of starving Americans, personally enacted a new onerous, fifteen-cent tax on Christmas. He personally did this because he hates Christmas. And America. If it had ended there, this whole story would have been just another example of how silly things get here in These United States. But that's not where it ended. Believe it or not, the White House actually caved to the pressure and suspended the rule pending further review. So there will be no marketing program for Christmas trees. Even though the farmers wanted it. Even though we're all supposed to be pro-small farmers and pro-small business. Even though the fifteen cents per tree could not possibly hurt hard-working Americans shopping at the tree lot, and probably wouldn't even show up in the retail price of the tree. Even though really small farmers--under 500 trees--were completely exempt, so it didn't even hurt the really small tree farmers. It's pathetic. And even though it doesn't matter what I think, and even though nobody's listening, I would just like to say for the record that I am in favor of farmers tending to their fields of living green things. And I am in favor of some of us--not all of us, you certainly don't have to, but some of us--bringing fragrant evergreen boughs indoors in December. But most of all? I am in favor of small groups of farmers or other businesspeople coming together and organizing and creating a plan that will allow them to work and grow and prosper. That just sounds so very American. It seems like only a crazy person would object to that. And that's precisely what happened. But really this whole post was an excuse to catch up with Graham, with whom I've had the chance to hang out a few times in gardens around the region. He told me about the terrible vole pandemic his Pennsylvania garden suffered this year - the worst ever. He says voles are more destructive than deer because they don't just mulch on hostas; they eat the centers and kill the whole plant. At least the family cat had a good year - it bagged over 50 voles over the season, more than earning its keep in kibble. Of course I asked about Graham's next book and I wish I could report on the answer but he's keeping the details under wraps (Here's his big tease about it). And he's still pondering what the one after that will be but he tells me he never runs out of book ideas. Or blog post ideas. Or magazine article ideas. Can't imagine that. And Graham's a Twitterer! (@Graham_Rice). Facebook, not so much. Digitally, there's a lag, with garden blogs catching on here first. He believes he was the first British garden writer with his own site or blog. Asked to name his favorite garden writers, Graham (cautiously, wisely) named Christopher Lloyd, whose book about foliage made him laugh out loud. Another source of laughs was Reginald Farrer, now long gone. And Pat Stone, editor of Greenprints and the Weeder's Digest, is also known to be funny. I was sad to hear that English gardening magazines, admired by so many American gardeners, are shrinking in number. Still holding on are the top guns - BBC's "Gardens Illustrated," and the Royal Hort Society's "The Garden," but other mags have stopped paying for photographs - at all. The cause is the same challenge faced by all print media, of course - having to compete for advertisers with online media outlets that can track results to the exact number of eyeballs. Speaking of garden writers, the U.K. has no equivalent of our big Garden Writers Symposium - because they don't need it; they see each other all the time. It's a small place - the country, and the world of garden writing. Organics are a hot topic in the U.K., as here, but natives and invasives, much less so than here. Of course I had to ask about lawns. We complain about boring, resource-intensive lawns here but what about the homeland of the greensward, where supplemental watering is rarely needed? Graham can't remember seeing anything on the topic in the British press or other media - zip. He thinks that's because they have such tiny lawns, anyway - or none at all - on their much smaller properties, especially in or near cities. They're much more likely to use decks or paving for their outdoor rooms, and no lawn at al. 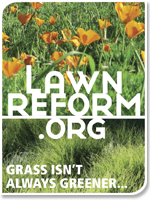 And maintaining the lawns they do have rarely involves the use of pesticides like grubkillers. Just a bit of fertilizer, thanks. Honestly, my favorite thing to talk to garden writers about is what ELSE are they interested in? And in Graham's case he has an actual media outlet for his other passion - music, British music. He has his own radio show, fer crissakes - Brit Mix, broadcast on 90.5 FM Radio Catskill - that covers "British music right through from the 1960s to next week". I'm a big folk fan myself, so asked for a tip in that genre - that would be June Tabor, with her mix of traditional and contemporary. When I went looking for the book cover above I put "Dry Shade Graham Rice" into Google Images and got the usual interesting mix of responses, including this photo of some Graham at some bar (one of 365). Definitely not our Graham; ours is hip without having to try so hard. If they were honest, all of my friends would admit that, like me, they spend a good amount of time moving stuff around—putting it away, giving it away, and reorganizing it. In my mailbox today was a long line of CyberMonday emails urging me to buy more. On Facebook, another long line of posts also says go ahead and buy more stuff but buy it locally. A competing thread says don’t buy anything. The fact is that, like most lucky people who are able to, I enjoy buying stuff and find it pretty easy to convince myself I can use it, if I don’t necessarily need it. But it’s getting less enjoyable to manage the collection I have. For example, I’d love to recommend some new gardening books as gifts, and I probably will. But the reality is I have run out of shelf space for my own, and stopped having time to read most of them a couple months ago. I rarely pick up a technical gardening book unless it’s a plant encyclopedia—and most of that can be found reliably online now. Personal gardening titles—essays, memoirs, and letters—are still enjoyable, but they’re piling up too. How about you—how do you deal with your stuff stream? Okay, I am now officially sick of the cowardice and lack of imagination demonstrated by many academic agriculture experts. They purport to address the question of the day: How are we going to feed 7 billion and counting people without destroying the planet? But they offer no answers, or only weak and partial answers. As you see, Foley does a nice job of characterizing the problem: Industrial agriculture is an ecological disaster...yet we have increasing numbers of mouths to feed. His answer? Organic and industrial farmers and Monsanto all need to talk about solutions. Seriously? Let's form a committee? Because that worked so well on deficit reduction! A TED event is a great forum. How could you not use it to float a pet notion or two of your own? And an actual idea, not some vague "third way" compromise between various special interests. One often gets the sense from such experts that they have no idea whereof they speak because they have never grown food in their lives. Of course, this may not be true in Foley's case, since his university bio lists "gardening" among his hobbies. Still, one imagines him out there with his Felcos dead-heading the ornamentals, not in the dirt yanking turnips out of the soil. 1. Change the scale at which agriculture takes place. Small diverse gardens and farms can produce more food on less land than factory farms, and work in concert with nature, not against it. 2. Substitute human labor for planet-destroying artificial fertilizers, pesticides, and machinery. 3. Listen to the real thinkers, who believe agriculture can be transformed by mimicking natural ecosystems. This week, Susan took a look at what gardeners around the web are thankful for and was personally thankful for the end of "women's page" journalism, which was where the gardening articles used to reside. But this mood has not entirely vanished from the gardening world. I once had an agent tell me about a gardening book proposal that my style was not sufficiently "genteel." Oh Lord, I hope it's not genteel AT ALL. Here's what I'm thankful for: Yes, yes, friends and family. Very much. And turkey, which is delicious, particularly when the bird has been draped in bacon and said smoky flavor makes it into the gravy. 1. Good-looking, easy up steel fencing from Lowe's. There is an iron worker out in the country near me who does wonderful work at a really affordable price. When you need a pot rack, he is the guy who will give you something artful. I've asked him about Victorian-style cast-iron fencing that will last two lifetimes. He says $100 a running foot. Ergo, until I win the lottery, I'll be surrounding my gardens with the Lowe's stuff. My son and I surrounded a new garden with this fencing on Memorial Day weekend in three hours. 2. My neighbor Dr. Greg Dodd, who donated such fencing to our school garden, even though his child is not yet in kindergarten and so not yet enjoying the incredible food we make in Garden Club. 3. Garden Club at Lake Avenue Elementary. The school garden is so enjoyable, in part, because it has different goals than my personal garden. Last year, I had a very strict planting plan that I handed out to each child on paper. This year, planting time was complete chaos. We offered the kids a huge array of seeds and though I tried to play traffic cop, they just scattered seed everywhere. Worked better! The goal of this garden is making an interesting meal in the faculty lounge once a week. So we need nothing in quantity--just a smattering of this and that so we can do something different each Friday. Cooking with the Garden Club kids and my partner Carol Maxwell--a really creative super-excellent cook--is one of the great experiences of my life. 4. Seeds from Italy. The seeds packages are so large, and the seed is packed so beautifully in foil, that the basic quality here puts most American seed companies to shame. And with the one exception of tomatoes, every variety I order from Seeds from Italy is the best-tasting variety in my garden. For a few years, this puzzled me. My upstate climate has so little to do with Bergamo, Italy, the home of the seed company whose wares Seeds from Italy sends. Then, researching a piece recently for Organic Gardening magazine, I learned how important latitude of origin is because it determines day length, and day length determines how many plants (though NOT tomatoes) behave. Bergamo and Saratoga Springs? Very close, if you follow a thin black latitude line around the globe. 5. Fruit trees from Fedco. Huge selection, nice healthy stock, a wonderfully opinionated catalog from big experimenters in the chilly state of Maine. Every year in June, I kick myself that I didn't buy more from them, especially when I'm reduced to rooting around the awful local nursery in search of a tree. 6. Tulips. What do I really care about in the garden? Put a gun to my head, and I'll say dinner and tulips. Oh, I have some other pets among the ornamentals--lilies, dahlias, roses, nasturtiums. But none that occassions such obsessive behavior, such as spending hundreds of dollars a year on blooms that will dazzle the town once and never reappear again. What can I say? It's a long winter here. Starting in late April, tulips are the kind of party you'd have if the DNA exonerated you after a long stretch in prison. 7. The basic skepticism of my character. For that I have to thank my parents, I suppose--just the right genetic mixture of Old World arrogance and wiseguyhood from Queens. Skepticism is so freeing in the garden! You ignore all complicated instructions and just get stuff done. As we have done in years past, we are once again putting out a call for any and all gifty handmade garden-related items that our readers make. Such as this sweet little hand-carved snail made by California artist Sandra Healy and sold on the wonderful Dirt Couture site, which features all manner of handmade garden-ish gifts from talented artists. So. Tell us about your stuff! Engage in some shameless self-promotion! We will compile them all into a future post on handmade holiday shopping opportunities. Just post a comment here with a link to your Etsy store or website or wherever people need to go to make a purchase. And please remember that if you post a link to your products, we are going to take that as permission to grab a photo of the product from your site to run in our upcoming post on the subject. And handmade means handmade! No books, please--we give plenty of love to books throughout the year. (Well, unless they are handmade books, artist books, letterpress, that sort of thing.) And no mass-produced tools or trinkets. The more handmade, the more one-of-a-kind, the more garden-ish, the better. If you're an artist and you're selling calendars or notecards featuring your garden/nature art (including, of course, photography), we would like to hear about that too. Spread the word! During this season of giving, let's give a little financial love to the artists and craftspeople, yes? Researchers and breeders of great plants. Volunteers like Master Gardeners and Master Naturalists. The abundance of nature around us, with lots of mentions of birds and even lacewings and flies (beneficial insects). Native plants (one mention), especially trees. And several newspaper columnists expressed thanks for their JOBS, and for the readers who help them stay employed. Only one writer mentioned something that would be high on my own list - the passalong spirit of gardeners who share their plants with anyone who'll try to keep them alive. A Broomfield, Colorado writer agrees and expands on that thought with: "I'm thankful for wonderful gardening friends who speak 'gardenese" and who understand and share plant obsessions. These are the same friends who generously share seeds, cuttings and plants, along with their knowledge and love of flora." One Corpus Christi, Texas writer says "I am thankful for rain, any rain." Also, for Xeriscape - something you'd never hear in the East. Clearly the glass-half-full type, he's even thankful for something caused by drought - "that many of the invasive grass weeds like guinea grass do not grow as rapidly and are easier to control." And finally he mentions an advantage of gardening in Texas that I can relate to: "I am thankful for two growing seasons." In Enumclaw, Washington a writer is happy to not have hedgehogs in her hedge, like they do in England, and to not have to sow lawn seed twice a year, like they do around Palm Springs. And her TOP reason to be thankful? "We don’t have to worry about malaria when we garden." Apparently in her travels she learned that when the pools of Versailles's gardens were created, mosquitos carrying yellow fever settled in and "France lost more than 700 souls creating those gardens". Okay! Nothing like travel to make you appreciate what you've got. She must have seen Japanese maples dying somewhere else because she's super-grateful that they grow well in Washington State. "We don’t have to worry about high fashion when we garden...I am thankful Seattle is the grunge capital of the world and that my neighbors accept the random, weird and downright sloppy outfits I wear when I garden. I’ve even been caught weeding in my nightgown." (That's Enumclaw again. I'm really liking her!). From the National Garden Bureau: "We’re thankful for the garden writers and bloggers who offer such a wide variety of inspiration and advice that keeps us dreaming and wishing for a garden 'just like that.'" Also from the Bureau, "We’re thankful for our friends who "ooh and aah" over our gardens no matter how many weeds we forgot for pull or how many sprouts the bunnies ate. A writer in the Seattle Times thanks garden writers and recommends a few terrific ones. Finally, Google unearthed this St. Petersburg newspaper page from January, 1958 with the headline 'Gardeners Thankful For Spared Blooms". Quick quote: "Easter Lilies, their foliage still fresh and green, are thrusting upward with the promise of and little Johnny Jump Ups show gay and dainty colors." Despite the typographical omission - of something - you get the flavor of garden writing in that era, which I'm thankful is over. And on the same page is a wedding announcement about Miss So-and-So, with no photo of the groom, which reminds me of an era of "women's page" journalism I'm thankful is long gone. Up until now, on Thanksgivings when I cook, I’ve been satisfied with small fresh turkeys that didn’t seem to be injected with anything weird. I was never one to sign up for the expensive “organic” birds through the local food co-op. In my view, the breast meat is bland and boring no matter what you do to it, and the supermarket turkeys are fine as a vehicle for dark meat, crisp skin, and dressing. But this year, I could no longer ignore the fact that Western New York has a bunch of local farms where you can buy fresh, heritage turkeys with interesting names like Bourbon Red, Standard Bronze, Black Spanish, and Royal Palm. I finally broke down. This year, I will be serving the meat that Marian Burros says has “turkey flavor that is merely hinted at in the supermarket turkeys.” After ordering up the two birds (I’m galantining one of them), I went online to see if there would be special cooking instructions for them. There wasn’t much info out there specific to heritage birds. What I did find was a bizarre and maddening mix of contradictory advice. I am finally beginning to understand why Calvin Trillin thinks our national Thanskgiving dish should be changed to spaghetti Carbonara. When is the turkey done? The official Butterball site is rigid on this. The thigh should be 185˚; the breast 170˚. The USDA recommends 165˚ throughout the animal. But in 2008, Marian Burros wrote that taking the turkey out when the leg/breast intersection reaches 150˚ and letting it sit for half an hour (while the temp inches up) might be the secret to a moist bird. Many professional chefs insist that taking the bird apart and roasting breast and dark meat separately is the only way to make sure the white meat doesn't taste like cottonballs. To brine or not to brine? If you have a fresh, uninjected turkey, you can moisten and flavor it with brining. I love the step by step Pioneer Woman instructions. Such copiously illustrated precision is only possible on a blog. Brining is huge now, with apple cider brine the flavor of the moment. But wait! Food scientist Harold McGee remains a non-briner; he says it makes the meat and drippings too salty; he instead recommends bathing all the cooked meat in a pan sauce before serving. In a similar revolution against decades of turkey wisdom, some experts strongly advise against basting. By the time you’ve finished reading all the advice on this topic, killing somebody—or something—is going to sound like a good idea. When those thoughts arrive, step away from the turkey, and pour yourself a big cocktail. Any recipe will do. So you didn't win—how about 15% off? The generous publisher of Wilder Quarterly has a new offer for readers of Garden Rant. Just enter this code: WQGR11, when a discount code is asked for (toward the end of the online subscription process). This entitles a reader to 15% off a full year subscription. The code will be good until November 28th for the first 50 purchasers. Thanks so much for playing, everyone. The comments were truly enlightening for me, even given that you had to say something in order to win. If these comments are any indication, about 99.9% of you want to continue reading print, with digital as a supplement. About 90% of you are missing something in the current crop of gardening magazines. And about half of you think this publication may be too pricey, and that is the only area in which I disagree. I have it, so I know that receiving 4 of these would be like getting 4 high-end-paperbacks full of interesting and often unusual garden content per year. With that in mind—and knowing what paperbacks cost—the price seemed unremarkable to me. I may buy a subscription and I would definitely consider this a great gift. As Carol/May Dream Gardens stated in her comment, if this is the type of publication we say we want, it will only survive if we support it. The winners were chosen by picking random numbers, not for the quality of their comments. But the comments were really great! Thanks for sharing them. A classy gardening quarterly—and we’re giving it away! With offices in Brooklyn, Wilder Quarterly is edited by Kate Sennert, and published by Celestine Maddy. The first issue—Autumn 2011—is 164 pages. Yeah, it’s really more like a book, lavishly illustrated with photography, and savvy art direction throughout. It’s totally unlike any of our traditional garden mags, and that’s on purpose. Wilder Quarterly is aiming at the new generation—urban farmers, rooftop vegetable growers, community gardeners, and city chicken keepers—as well as those of us who have been doing all those things for years and didn’t realize we were on the cusp of a new wave. So far, the word on Wilder is that it addresses a different audience than that aimed at by the current gardening magazines. That is likely true. What isn't true is the assumption that those magazines were satisfying the "older, financially secure females with college degrees" which is how Wilder horticultural edior Jessie Keith defines the traditional gardening demographic. All generations and all demographics of gardeners want new and exciting content in their magazines. We just haven't been getting it—with rare exceptions. Celestine Maddy defines the Wilder mission like this: "focusing on ‘life through the lens of the growing world’—growing indoors and out, culture, travel, food and design." All that said, there are really a lot of great articles about growing flowers in here. I enjoyed the interview with Russell Stafford of Odyssey Bulbs, and loved the glimpse of filmmaker Jonathan Caouette’s backyard refuge in Astoria, an impossibly lush space filled with tropicals I do wish the interviewer had asked him more about the plants. And there’s advice about bulbs and complete instructions for building a modular cold frame. There is also an herb piece by Dominique Browning, words and recipes by celeb chef Josh Adams, and an extensive interview with mycologist Paul Stamets among the 30-odd articles. I haven’t gotten through the whole thing. (You can find some complimentary mentions of Wilder Quarterly in The New York Times, Design Sponge and Cool Hunting.) What you won't find in here: advertising. Wouldn’t you love to check out Wilder Quarterly? We have 3 entire one-year subscriptions to give away—and if you clicked on the publications’s link, you know each is worth $60. Not only that, a portion of what your subscription price would have been will be donated to the Fresh Air Fund, as with all Wilder subscriptions. Just reply in comments—what do you think the direction of garden publications should be? Is this a good start? Or is the future online, like the snazzy digital mag Leaf (which can also be an on-demand print mag). I’ll choose randomly from comments and announce winners Sunday at 10 a.m. EST. Here's another in my ongoing series of "Drunken Botanist" cocktail articles for the North Coast Journal, loosely based on my forthcoming book of the same name. Forgive the Humboldt references, which are, of course, of interest only to people in Humboldt. Seems like everyone in these parts has an opinion about what Humboldt needs to make it truly great. A railroad. A trail around the bay. A general plan. A Wal-Mart. A Trader Joe’s. One grand, vitally important addition or improvement that would change everything. I agree that Humboldt is lacking in one critical area, but it doesn’t involve railroads or general plans. What Humboldt is missing is locally-made hard cider. Think about it. We are blessed with an extraordinarily long apple season, with the earliest varieties ripening in August and the last flush of ripe fruit still clinging to branches in January. We are the inheritors of the pomological legacy of Albert Etter, who started growing and breeding apples here before the turn of the twentieth century. (We have him to thank for Waltana, a crisp, dark-skinned apple that keeps all winter, and Pink Pearl, the pink-fleshed apple that makes unforgettable pies.) And cider is the perfect value-added crop. Apples that aren’t cosmetically flawless still make great cider. Apples that taste weird or are oddly-shaped make great cider. Locavores and organic orchardists, rejoice! Imperfect, non-corporate apples are no problem for the cider-maker. And with its crisp, dry flavor and modest alcohol content, hard cider is a real crowd-pleaser. Beer, I was surprised to learn when I read the Journal a few weeks ago, is only appreciated by men. (Note to said men: My upcoming beer and beer-distilled whiskey party may have to be a female-only affair. Serves you right.) Cider, on the other hand, appeals to every palate, and is the perfect alternative for non-beer drinkers at barbeques, baseball games, and other such beery gatherings. So. Why every brewpub in Humboldt County doesn’t offer a locally-made cider on tap remains a mystery. To enjoy this month’s recipe, you’re going to have to find a friend with a backyard cider house, or turn to a non-local cider. I’ve worked my way through most of the widely available versions so you don’t have to, and here’s the deal: Hornsby’s is actually owned by Gallo and it tastes like it. Strongbow is the British Budweiser of ciders, which is all you need to know. Opinions vary on Woodchuck and Ace—I dislike both, but other tasters in this household disagree. Fox Barrel is California-made, light, and not too bad. Olympia’s Spire Mountain is a brilliant example of the kind of pure, well-crafted artisanal cider we should be making here. Aspall, a British cider, is so crisp and bright and perfect that it will turn you into a cider alcoholic. Like our founding fathers, you will drink so much cider morning, noon, and night that you will go stark raving mad or overthrow the monarchy, whichever comes first. You’re also going to need some kind of apple brandy. If you want something amazing, transformative, something that will give new meaning to your life, something that has the power to motivate you to get through a dreadful Monday, a Thanksgiving with the in-laws, or a long, miserable winter, you’re going to want a bottle of Leopold Bros. New York Apple Whiskey. Made in Denver, this blend of New York State apple juice and fine whiskey is barrel-aged and bottled at 40% alcohol. It is sweet in the way that an apple is sweet, but it’s not weird. It’s just perfect and amazing in ways I can hardly describe. (If you’ve ever had pommeau, a French blend of unfermented apple juice and Calvados, it’s like that.) If you can’t find it at a local liquor store, ask them to special-order a case and keep it in stock. It sells for about thirty-five bucks, and trust me, you won’t regret it. You’ll also need some apple schnapps. Berentzen Apple Korn is available locally. I confess that I don’t love this stuff on its own, but it mixes well. If you’d rather take this drink in another direction, you could experiment with tiny quantities of a spicy liqueur like St. Elizabeth Allspice Dram, Domaine de Canton ginger liqueur, Benedictine, or anything else warm and autumnal. This drink is a shooter or a bomber, which means that you’re going to drop a shot glass into a larger glass and drink the two together. It’s a bit of a novelty, and somewhat tricky to sip, but you’ll get the hang of it. It’s inspired by a version I tasted at Lab, a wonderfully clever little bar in Montreal, where they take their apple cider seriously. I’m naming it after Albert Etter in hopes that it will someday be made with local brews from his apples. Drop the shot glass into the tumbler. The two liquids should be about level and will not mix until you start drinking. If you’re going to make any of the substitutions I suggested, feel free to experiment with the ratio of apple brandy to other liqueurs. Just make sure you end up with 1 ounce of liquid in the shot glass. But for my next garden I quickly grabbed these photos from the realtor's slide show about my new rowhouse, and I took a bunch more as soon as my offer was accepted - before all the leaves dropped. The perfect-size-for-me-back yard is, except for a few azaleas which will soon be offered to anyone who'll dig them up, a blank slate. Goody! On the right is the view from the back door, where my new screened-in porch will go. I've coveted these bug-free oases for years now and soon I'll have my own! Below, the front yard is all lawn with a few more azaleas (the default shrub for the Mid-Atlantic, no matter the exposure). Like the azaleas, the lawn is doomed, to be replaced by some seating for sure, but what else? That brings me to the next mistake I won't be repeating. 2. Not getting design help. Now to be fair to my 1985 self, I did enlist the free services of a nursery's designer for my back yard, and have thanked her a bazillion times for creating the bones of a great design and steering me toward great shrubs I'd never heard of (because they aren't azaleas) like Viburnums, Pieris japonica and cherry laurels. But I had a small budget and most of my current garden has been a DIY job, design-wise and plant choice-wise, and my mistakes still show. This time around, every square inch of my manageably sized garden will be professionally designed before the first daffodil shows its face in March. Terraces and paths will be created and the larger plants installed before I start playing with the small stuff. Can you see the determination in those italics? See, I'm already anticipating that whatever design I'm presented with, I'll be fussing with it and making it as weird and personal as the garden I'm leaving behind. So help me out here. What would YOU do differently if you were starting all over in your garden, or starting a new one? My partner in life is Nancy Szerlag, the gardening columnist for the Detroit News for 14 years. I started my column on yardening in the Detroit News about two years ago. Within months I was getting almost as many e-mails as Nancy, and she has a tremendous following. I had found an audience. So many of them compliment me for giving them information in simple terms that they can understand. I believe most yardeners have the position - Just tell me what to do and when to do it. I will do it. I give talks at Home and Garden shows and I often lead with my definition of a gardener and then my definition of a yardener. Then I ask how many yardeners do we have in this audience. I have never had less than 60 to 70% in the group putting up their hands and smiling as they did it. I can’t say that I like the term yardening any better now than I did then, but I did grow to appreciate the commonsensical outlook of yardener Jeff Ball, the Detroit News garden columnist who died Friday after a long battle with cancer. Ball was the epitome of the old school problem-solving approach to gardening, but he was also very concerned about the soil web, the native plant movement, and the environmental nightmare that is traditional lawncare. And unlike some old school garden writers, he knew that understanding digital technology was becoming more and more essential in reaching gardeners of all levels. Like his partner, Nancy Szerlag, Ball wrote as an independent contractor for the Detroit News. The paper I read, the Buffalo News, doesn’t have a fulltime garden writer either, though we are lucky to have local expert Sally Cunningham share her horticultural knowledge once a week. Contracting with a local expert —even if not a fulltime employee—will eventually become a luxury many publications won’t bother with, as budget-friendly syndicated lifestyle verbiage becomes increasingly acceptable to editors who don't care anymore. The world of garden journalism is changing along with all journalism—who knows what we’ll see when we come out the other end. In the meantime, if you have a garden writer like Jeff Ball writing for your paper, you’re lucky. Thanks, Jeff, for reading and commenting—we’ll miss you, and so will all your readers! Here's Susan's 2007 post about Jeff Ball. The perfect, rousing accompaniment for a cup of coffee this morning, a TED talk by Roger Doiron. Doiron is the founder of Kitchen Gardeners International and a big force behind the White House vegetable garden, here doing his damnedest to make us all gardeners. When I was 23 and living in New York City, I had a new boyfriend who loved upstate New York, the well-preserved old towns where nothing of significance had happened in the last hundred years, the poverty, the natural beauty. We would head out of the city in his car, an ancient and beat-up Chrysler convertible, while he desultorily shopped for a old house for himself in the various counties north of Westchester. He knew a lot about architecture and he soon taught me enough that I could read a landscape in an entirely different way. I no longer saw a collection of houses, I saw history. Funny how a little bit of knowledge can transform the way you see the world around you. Something similar happened to me in my garden half a dozen years ago. I stopped tilling my vegetable garden and started mulching it heavily with ground up maple leaves and lawn clippings. And the transformation of my soil into devil's food cake with an icing of worm castings was so dramatic that I became curious about the biology of the soil and learned something about that, as well as a little about the nitrogen cycle and the carbon cycle. Not enough to be really authoritative on these subjects, but enough to view the entire world differently. Now, I never look at a photo of a landscape parched by drought without seeing a dire lack of carbon covering the bare earth, either in the form of living plants or a dead mulch. Now, I can't look at a pile of brush or fall leaves without seeing the key to life there, fodder for earthworms, and fungi, and soil bacteria, who will convert it into fertlizer for my crops. I don't understand why anybody would send such a lovely bunch of carbon--or a lovely pile of nitrogen in the form of grass clippings--off his or her property. Yes, my city composts this stuff. But no, I'm not generous enough to share. I want it all in MY garden. And if my neighbors are willing to rake these riches out of their flowerbeds and off the lawn and set them at the curb in brown bags--well, I'm willing to be the town eccentric, wheeling her barrow down the street in order to collect it all. I may look like a crazy person, but that's only to those people whose eyes are not yet open. Garden Bloggers: We're Going to Asheville! We are beyond excited that longtime Friend of Rant Christopher C is inviting us to his corner of the world for the next Fling--although he's not doing it alone; there are always many bloggers involved in putting these things together. As you probably know, this gathering began a few years ago in Austin, and has since been to Buffalo, Chicago, and Seattle. It's organized entirely on a grassroots basis and has been extraordinarily successful. So we do hope that you'll spread the word on your own blogs, Facebook, Twitter, etc--and that you'll let the organizers know early if you're planning to attend. They've reserved a block of hotel rooms and will be busy making other arrangements for which a head count would be useful. And! Sponsors! These affairs always need sponsors. I don't know what the local group in North Carolina is thinking about in terms of sponsorship, but if you're in a position to be a sponsor, I'm sure they'd like to hear from you. We'll share more information as it comes together. Meanwhile, get over there and check that out. Oh, and there's a Fling Facebook group, too. If There's An Easy Way to Juice a Pomegranate, I Don't Know What It Is. This time last year, I made a little homemade grenadine during pomegranate season. We had a party shortly after that in which we mixed up Pink Lady cocktails according to this recipe in Imbibe magazine. The drinks were a hit--and although we hadn't been using grenadine around the house before that, we definitely put it into heavy rotation after the party. By that time, pomegranates were out of season. We tried buying grenadine at the liquor store, and we tried making our own using bottled pomegranate juice. Neither were remotely as good as the homemade variety. First, you have to juice the pomegranate seeds. This is not easy. Lacking any other fancy fruit-squeezing equipment, we used a basic citrus press. It took me about an hour to juice five or six pomegranates in this fashion--enough for about 2 cups of juice. This may sound like way too much time to spend on the making of homemade grenadine, but it was really rather pleasant--I poured myself a nice drink, listened to NPR--really, it wasn't so bad. But if anyone has a more efficient juice extraction method, I'm all ears. Once you've got your juice, here's how the recipe goes. Most recipes don't call for any water, but I've found that it helps to melt the sugar in a very small amount of water before adding the juice. Up to you. In a saucepan, bring half a cup of water to a boil, then add the sugar. (If you think you'd like your grenadine to be a little less sweet, hold back some sugar until after you've added the pomegranate juice.) Stir until dissolved. Add the pomegranate juice and stir well. Give it a taste and add more sugar (or more juice) if needed. Once it's right, add an ounce of vodka and pour into a heatproof bottle or jar (a mason jar works well). A homemade syrup like this will keep in the fridge for a few weeks, and it will stay fresh even longer in the freezer. The vodka helps kill bacteria and keeps it from freezing solid. It will be syrupy in the freezer, but it's fairly easy to spoon some out to make a few drinks. It "melts" quickly in the cocktail shaker. There's the finished product. It's a lovely rose color, and it plays well with gin and vodka in all kinds of cocktails, giving everything a lovely pinkish hue. Imbibe has a number of cocktail recipes that involve grenadine; check them out here. Nice story, great video. Via BoingBoing. Announcing: Michelle Obama's Gardening Book! The book, Mrs. Obama’s first, will be issued simultaneously in print and digital editions. The print edition will be a gorgeously illustrated four-color hardcover that includes stunning photographs of the White House garden and Mrs. Obama throughout the seasons, as well as other community and school gardens from around the country. Mrs. Obama accepted no advance for the book and will donate all net or after-tax author proceeds to a charity or charities to be named later. Random House, Inc. will also make a donation to an appropriate charity to be named later. Ideas and resources for readers to get involved in the movement to create community, school, and urban gardens, support local farmers’ markets, and make small lifestyle changes to achieve big health results. Sounds great, but gardenwriting and blogging insiders are dying to know what garden writer helped write the book. We assume there was one, right? Here's my answer to the campaign to nominate the "White House Farmer", in which I go decidedly local (Feb '09). Here you see the gardens at the Bancroft Elementary School and meet the garden coordinator there. Bancroft fifth-graders are the First Lady's (now famous) garden assistants. I made my pitch for going beyond just a kitchen garden and Greening the White House Grounds. (Dec '09). I predict we'll hear news about the whole 18 acres becoming more sustainable sometime in 2012. In White House Gardens I report on visiting the famous site in October of '10.